Social media feeds are a-buzz with discussions on January diets, detoxes, dry January and veganuary. Guess what? I’m in on it too. I’ve been following cookbook author Anna Jones’s seven day ‘reset’ since Sunday. But unlike a diet or a cleanse, it’s just a week of delicious eating with fruits and vegetables at the forefront. I printed off her pdf last Friday, punched holes in the paper and put it in a binder. I followed the grocery list and stocked up on beans, pulses and lots of greens. On Sunday evening I prepped for a few days ahead. For myself. Just me. The boys, they would be eating frozen chicken pot pies and the odd vat of slow cooker chilli. They’d survive; this week was about me. What a strange concept, cooking for one, after a December full of family and communal eating. It was a joyful time, yes, but somewhere towards the end of the holiday, after the last peanut butter ball, all the wine and even the ‘not so loved but eaten anyway’ Christmas cake, the plot was lost. At times like this the only answer it to swing the pendulum the other way. To take a quiet breath. To reset. As it turns out, this quiet time for me is sparking a different kind of joy. Yes, the joy language is back in my vocabulary. It’s Marie Kondo’s fault. Her new show on Netflix, Tidying Up, has pulled me back into her world, the world where one tidies up by purging things that don’t spark joy, but thanking the item before flinging it into the recycling bin. Since this reset began, I’ve been sparking joy by cleaning out my kitchen cupboards, thanking sesame seeds from 2017 for their efforts. I’ve thanked that massive bag of toasted coconut shards from Costco I knew I’d never get through. And the nutritional yeast from who knows when? I thanked that too. Then I turned to what is sparking joy – my mason jars full of pulses. Cans of tomatoes and coconut milk ready for curries, and, my next meal – a breakfast kheer, a turmeric milk version of rice pudding – simmering on the stove. I used to think a week of ‘special eating’ for myself was… embarrassing. I hated the thought of being the one who said – no thanks, I’m avoiding that this week. I wanted to blend in. Be fun. Eat it all. But after some adult reflection, I’ve realized these are just excuses. The truth is, I’m scared of restriction. When food is fixed, I get nervous, itchy, and more than anything, hungry. But I’ve read that Anna Jones also hates feeling hungry. And clearly she doesn’t shy away from prioritizing herself from time to time – heck, she wrote this thing. Prioritized and satiated? This was for me. So here I am with sweet turmeric swirling through the air, knowing that my breakfast is made for tomorrow and the next day too. I’ll be back to normal in a few days, eating from the slow cooker with the rest of them. But I’ll know my reset binder will be sitting there on the shelf, ready to spark joy whenever I need it. Soak the rice in one bowl and the cashews and almonds in another in cold water for at least 30 minutes. Drain the rice and put it into a saucepan with the milk and 250ml of cold water and bring to a simmer. Cook for 20 minutes at a gentle bubble until the rice has puffed up and the liquid is beginning to thicken. Meanwhile drain the nuts and finely chop them – you can do this in a food processor if you like. 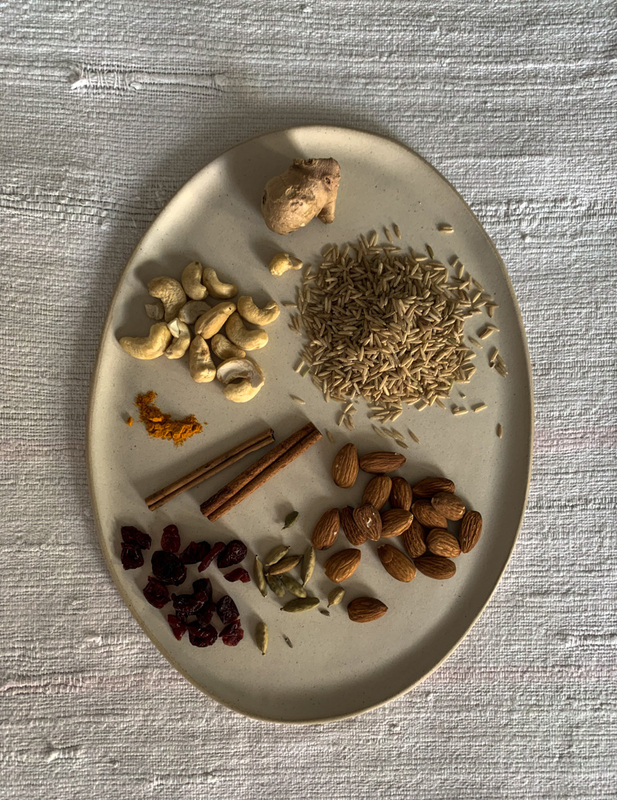 Bash the cardamom pods using a pestle and mortar and remove the fragrant seeds, then discard the pods and grind the seeds until you have a powder. up with a little boiling water from the kettle. If you are making this ahead then cool then put into the fridge once cool. Reheat half for each day with a little extra milk until piping hot. Serve half spooned into a bowl with the lime zest and coconut flakes on top; if you have a sweet tooth you could add a little extra maple on top. Place the other half in the fridge to reheat tomorrow.